I have tried quite a few skincare brands and Clarins remains my favourite to this date. I've simply loved every single product I've had from them. I was approached by Fragrance Direct a few weeks ago and asked to review one of the products from their website. I was really excited as I have used their website before and really enjoyed their service and the amazing promotions they offer. My product of choice was Clarins Vital Light Day Cream SPF15. It's Summer so I wanted something with at least some sun protection. This cream is perfect. It's suitable for all skin types and combines agents to both fight existing signs of aging and prevent further damage caused by UV rays. Cochlearia Officinalis and Waltheria extracts help strengthen the collagen network, reduce wrinkles, firm and promote a youthful-looking glow. Spergularia extract helps lighten age spots and hyper pigmentation for a more even skin tone. I absolutely agree with all the claims. My fine lines have reduced and my skin has never felt so healthy, smooth and radiant and even the pigmentation I have around my mouth has faded. I've tried many things for pigmentation before and nothing has worked as well as this cream. Well done, Clarins! And on top of all the benefits mentioned above, it smells amazing and feels very light on the skin. Although very hydrating, it sinks in quickly without leaving my skin feeling tacky or looking greasy, which is a massive bonus especially in hot days. Only recently I spotted that this face cream is targeted more towards 50+ women. I'm 33 now but I honestly don't mind. I think the sooner we look after our skin, the better. And I've achieved great results with it so I'm happy and will certainly repurchase after this one runs out. If you are in your early 20's, however, I'd probably recommend sticking to something simpler (and cheaper) like the Clarins Multi Active range, which I've also tried and loved. 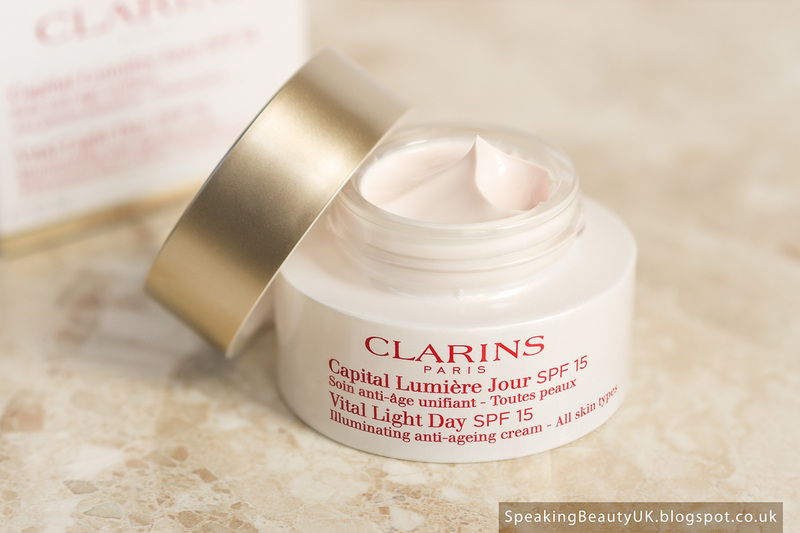 Clarins Vital Light Day Cream retails for £60. You can buy it through Fragrance Direct (here) for £58.50. I know it's not a big discount, but considering you get free delivery on orders over £40, why not save some money? Better than nothing. But I'd highly recommend checking Fragrance Direct whenever you have a product you want to buy, as in some cases you can save over £20. They sell pretty much everything from Fragrance to Makeup, Hair, Skincare, Mens, Bath & Body. You can find a massive range of products including brands like Clarins, Mac Cosmetics, Clinique, Elemis, etc. For orders below £40, standard UK delivery costs £1.99. They also deliver overseas.